Firday means last working day for a lot of you, but for tennis fans it means Quarterfinals. Ongoing this week it's the last Premier tournament of the year: Moscow's Kremlin Cup. A lot of action took place during the week with huge surprises as the first round losses of seed n°2 Marion Bartoli and home favourite Nadia Petrova (seeded 6th). Swedish veteran Sofia Arvidsson is well known on the circuit for her great feeling with the indoor tournaments, but up to now she had always had her best results in the small tournament of Memphis (two titles there and one more final). Coming from the quarterfinals in Linz she was surely looking for more here in Moscow and clearly showed to love the Russian atmosphere and court, since in her second round she defeated world top 10 and seed number 2 Marion Bartoli from France. Today she was facing the last Russian hope for the home title, seed number 7 and two-year-ago runner up, Maria Kirilenko. Sofia, still busted from her great win against Bartoli, started very solid and took advantage of a not that great day from her opponent. The Swedish broke early in the first set and capitalized that break flying on 5-3 up, when Kirilenko was called to serve to stay in the set, but failed by handing it with a horrible Double Fault. In the second set, it looked as if the plot was set to be the same as in the first, but after breaking the Russian, Sofia let Kirilenko break back, giving some hope to the few people in the stands of the hall. Arvidsson didn't get discouraged and kept playing her tennis and by giving pressure on Kirilenko's serve with a couple of great returns she broke again and went up 5-3, this time serving for the match. Closing it wasn't an easy job, as Maria wouldn't let the Swedish simply go away with it, but despite a few chances to reopen the match, at the 4th Match Point Arvidsson could finally celebrate for her first semifinal here in Moscow. 6-3 6-3. 2012 won't be remembered as a good year by Caroline and her fans, as less than 10 months ago she was world number 1 whist this week she's in Moscow way out of the top 10. The young Danish is a hard worker though and she didn't let all that take her down and as the great fighter she proved to be in the past years, she went here to Russia with the only aim of going the further possible in the draw. Having dispatched in a very convincing fashion her friend Urzula Radwanska in the second round, she came into this quarterfinal as the real favourite against Slovakian world number 14 Dominika Cibulkova. The first set seemed to reflect the forcasts: Wozniacki, who seems to love the slow surface of the Kremlin Cup, showed some of her best defensive skills and often could use Cibulkova's power to hit clean winners that from 2-2 let her win 4 games in a row to win the first set without even giving the Slovakian the chance to break her serve once. But Dominika is a fighter too, so she started the second set with a renewed attitude and finally could break Wozniacki and take the lead, but the Danish would break back and after a solid hold and another break of Cibulkova's serve, she went on serving for the match. The next 3 games none of the two could win more than a point on her own serve, with Wozniacki set to make no point out of it on the tie-break neither, losing it by 7 points to 1. All the momentum was then in the Slovakian's side of the net, but coulnd't hold it for long, as the former world number 1 looked far more focused in the 3rd set and astonished her opponent by running on every ball and retriving them with depth and power even from the FH side. Cibulkova slowly faded from the court and it was all on her Caroline's hands, which didn't tramble again and so she could secure herself a place in the semifinals by winning for 6-2 6-7 (1) 6-1. She will meet Arvidsson tomorrow in a very Scandinavian match. The other Semifinal will be played by Seed number 1 Sam Stosur, who dismantled Zakopalova 6-1 6-3, and seed 4 Ivanovic, who won the Serbian derby against Dolonc 6-4 6-1. In the last International event of the WTA season there was only one seed left after the 2nd round and it was Italian Roberta Vinci, number 1 in the seeding, who had to face in the last match of the day Venus Williams. But let's start from the beginning: the first semifinalist of the tournament came out of Hantuchova vs Dominguez Lino's match, with the slovakian having reason of the spanish in straight sets 7-5 6-0. In the second match, last year's Runner Up, Monica Niculescu from Romania was facing Czech Lucie Hradecka. Niculescu, coming from a nightmarish season of injuries and bad luck started the week with only 11 wins in the whole year, but after a tough match against Swiss Oprandi in the opening round, she had stunned the second seed Goerges and went into this match with a new confidence. Hradecka, who shocked 7th seed Paszek in the first round, seemed completely wicked by the uncommon game of the Romanian and spread a huge ammount of Unforced Errors in the first set won by Monica for 6 games to 0. In the second Lucie could find a hint to deal with the insidious slices of Niculescu, but in the end it was the Romanian to close the match 6-0 6-4. 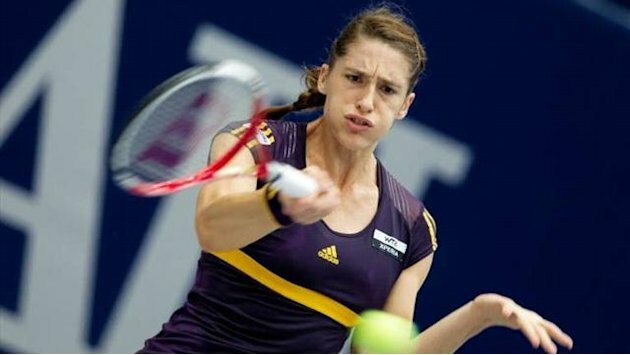 If last year's runner up had to face a bad 2012, even a worse luck was the one to hit last year's top 10 Andrea Petkovic. The German, as you may know, has been forced out of the courts for the first few months of the year because of a back injury and during her very comeback in Stuttgart she injured her ankle, ending up forced away from courts for a few more months. Her few matches she had played so far, since the Us Open, hasn't been really convincing, but so it wasn't here in Luxenbourg, where the German had to play a long and tough match to make it through the first round against the talented Spanish Muguruza before scoring a very important win against Jelena Jankovic in the 2nd round. In the quarterfinal she was facing another unlucky player for the season, Ksenia Pervak, whose citizenship's switch to Kazahstan didn't make any good for her sinking ranking. The two players started very tensiously, Petkovic opened the match with 2 double faults, which led to a break, immediatly followed by a rebreak on Pervak's serve. The two slowly wore off the rust and showed some amazing rallies as they played a very similar game, made of solid groundstrokes and incredible defences, but at first it looked like Ksenia's FH was more inspired than Andrea's and she went up 3-2 40-0 on her own serve. A little slip of focus and a great reaction from the German cost the Kazhastan the break of lead and eventually the set, as the irritation deriving from this miss made her lose the calm she had in building up the points in the first half of the set, which meant a lot more free errors. On the other side of the net, Petkovic, who's very well known for her smort tennis, understood the situation and didn't really have to do much more than keep the ball in play for a couple of shots, before Pervak would hit a flashing winner or, way more often, a bad error. After the first set's win for 6-3, Andrea looked in fair control of the match and so it was until the end, with Pervak more and more asking too much from her shots and missing a lot more than what was actually staying on court. 6-3 6-2 the final score for the German, who will now face Venus Williams for a spot in the final. In the last match of the night session the American had a tough time beating the n°1 seed Roberta Vinci, in a very thrilling and high quality match. The two battled with great serves and only in the 8th game we had the first break points and Venus didn't fail to convert them, but with a burst of pride the Italian fought back and took the set to the tiebreak. There Williams has been too good and by hitting a couple of impressive winners and a pintch of luck (a really lucky netcord on a keypoint) she secured the first set. In the second both of them kept fighting hard on serve and on return, but this time the variety of game and the fantasy of Vinci had to bow down to the power of Venus, who took the match in straight sets: 7-6 6-4.